Effective Google AdWords Management is an ongoing process and you make sure you get the best ROI out of your Google AdWords budget, you need to partner with a Google AdWords Management Specialist. Each Google AdWords campaign is different and each client has different conversion goals. As your Google AdWords Manager, Eurisko will create a custom plan designed for your success. At Eurisko, we use Google AdWords to deliver adverts explicitly to web users looking for information in respect to a certain product or service. We like AdWords, it is flexible and provides customizable options to help increase Brand Awareness, drive new sales or build a database of hot prospects. It is highly practical for our customers as the solution centres on cost per click (CPC) pricing model, where customers set their maximum cost per day campaign spend and a payment only applies if their advert has been clicked. Managing your performance marketing spend is part art and part science. The key to running a successful campaign and minimising your wasted spend is to continually review your performance against your goals and outcomes. Good governance is extremely important and knowing how to correctly adjust your campaign without compromising your spend or KPI. Track and account for every action, dollar and conversion event. Identify motivation factors, call to action and sales experience to maximise future sales opportunities. Many organisations have dipped their toes into the world of SEM and have taken a set and forget approach to its management – invariably leading to wasted spend, disappointing results and reservation to continue. 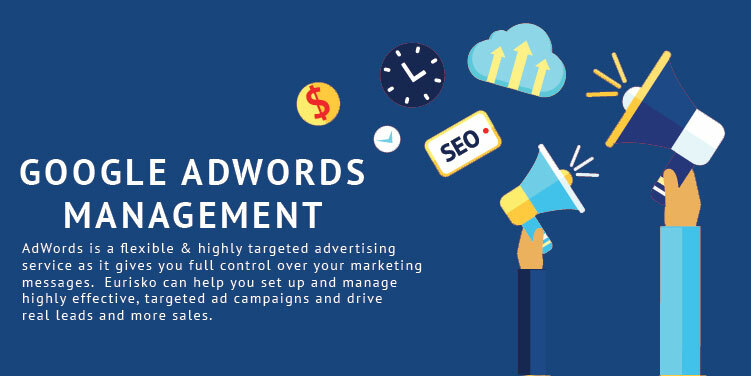 If you’re currently seeing poor performance from your campaigns or feel that your current agency has you on a set and forget program that has seen your growth stagnate, then contact us now to speak to one of our Adwords Management experts! Eurisko’s Google AdWords Management services also extend to the Google Grant for Not-for-Profits. If you’re an NFP who would like to see if they are eligible for the Google Grant, please contact us for more information.